Juicing has recently grown more popular. Combining raw produce into a form that is a much easier way to consume the recommended daily amount of fruits and vegetables has been simplified with the use of a juicer. 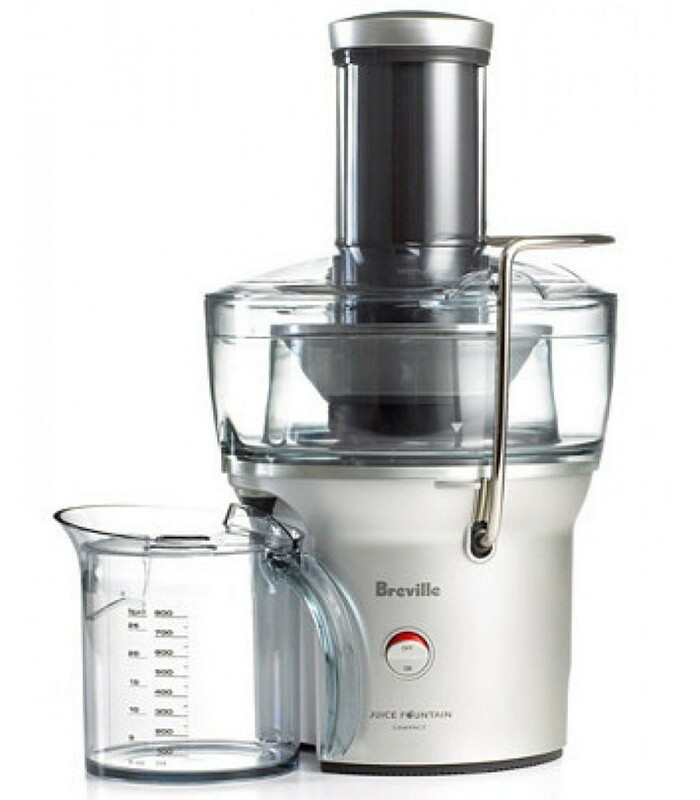 The Breville BJE200XL juicer offers a compact designed appliance that is packed with power. The 700 watt motor of this amazing juicer spins the filter basket at a speed that extracts eight ounces of juice in only five seconds, and to top it all off, the pulp is collected within the base of the juicer itself instead of in a unit beside the appliance, which is a great design to save counter space. The Breville BJE200XL is not only one of the most effective centrifuge juicers on the market; it is also a juicer that is extremely affordable. With a price point that is under the $100 mark, it is hard to believe that technologically advanced features such as the three inch circular feed chute are included. This feature allows the juicing of fruits and vegetables without the need to cut the raw foods into smaller sizes. This juicer also includes features like a stainless steel mesh filters and titanium cutting discs that help to promote juicing efficiency. Additionally, all of the parts of this juicer are dishwasher safe, which helps to make cleaning up a breeze. It’s extremely compact and can easily fit in a small kitchenette that has little extra counter space. The Breville BJE200XL is a powerful juicer that separates the pulp and other discarded materials like skin and seeds from the juice in mere moments. Cleanup can often be a hassle, but this juicer makes it simple with dishwasher safe parts that can be disassembled in just a few minutes. Whole fruits and vegetables can be placed directly into this juicer. There is no longer a need to spend time cutting them up before extracting their juices. In fact, it even juices whole apples without the assistance of a food pusher. If the juicer is being used to serve one person it works great, but the mesh filter is too small to handle much more pulp than that. The pulp will need to be removed from the mesh filter regularly. If it becomes overly full, the juicer may begin to leak. The pulp that is extracted from the fruit tends to be a bit wet, which means a small amount of the item actually being juiced is turned into compost. Some may consider fruit and vegetables that are not being fully juiced a waste of good produce. The Breville BJE200XL juices at a fast speed, so some items like tomatoes tend to froth when they are juiced. Ingredients tend to spew out of the top of this juicer, so make sure to hold your hand firmly over the lid when juicing at high speeds. Entire fruits and vegetables can be juiced with ease. In fact, there is no need to push the produce down into the blade to get the desired juice. Clean up is easy with the Breville BJE200XL. All of the pieces of the juicer are dishwasher safe, and they can easily be taken apart with snap locking technology. The quality of the juice produced from the Breville BJE200XL is good, but it does sometime produce froth when certain fruits and vegetables are juiced. This juicer is one of the most powerful ones available on the market for under $500. It’s a beast of a machine that will juice anything in a matter of seconds. Surprisingly, the Breville BJE200XL is a juicer that does not produce a lot of ambient noise at all. In fact, it may not even be heard juicing in the kitchen from the family room. The juice yield overall is excellent for this juicer, but the pulp can be a bit wet, which means that this is does not yield quite the amount of juice that a top end juicer would be able to produce. This 700 watt juicer has a 14,000 RPM peak output. The central tube is designed with a three inch diameter to accommodate the juicing of larger produce items. A top of the line stainless steel micro mesh filter and titanium cutting discs are included. A one year warranty is included with the purchase of this juicer. The juicer may produce a bit of a juicier pulp, but the juice yielded in a matter of seconds will help make this one of the more beloved appliances in the kitchen. There are not many juicers this powerful that have a price point that is under $100; in fact, it is rare to find such a quality juicer under $500. If a new juicer is in the budget, definitely consider the Breville BJE200XL as a quality option.